Dashing off an email just is not as infinitely satisfying as sitting down to write a lengthy, personal note. And hearing the mechanical "you've got mail" voice, is not nearly as soul soothing as the gentle swing and click of the mailbox. Writing a note to favourite friend should be fulfilling, a labour of love. Your friend as they bend down to collect the mail from in front of the front door, riffling through and coming upon your letter, should feel her heart flutter a little. Everyone loves to receive mail that is not a bill or a flyer. And everyone, everyone, loves to feel that someone thought them special enough to take the time to pen some special words just for them. If the correspondence looks as wonderful as the words read, all the better. Start with some beautiful note paper or an exquisite card. 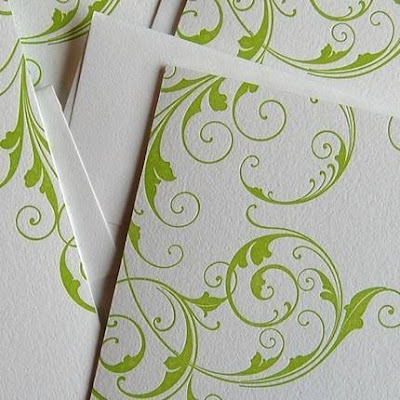 These elegantly flourished letterpress cards for example, can be found in the shop of pistachiopress. Pick up a pen - not the pen that came free from the last hotel you visited, but something a little more dignified. Truly, having a pen that makes me feel elegant, makes me more conscious of my handwriting, making it neater, straighter, tidier. 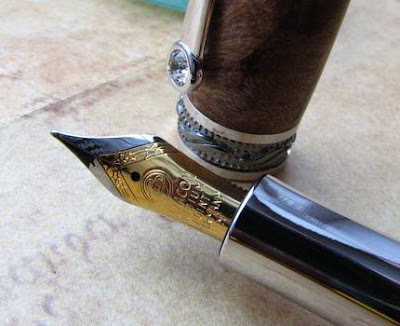 This is a pen that I am certain would turn my typical scrawl into a perfect old-world script. This pen, and other beautiful specimens for the true pen connoisseur, are available from moonskywoodworks. Once you have poured forth your thoughts, and signed off with all your love and well wishes, carefully blot your ink, fold your note, and slide it into the envelope. Envelope gum is unappealing - don't lick it. Instead, add a charming finishing touch of sealing wax. 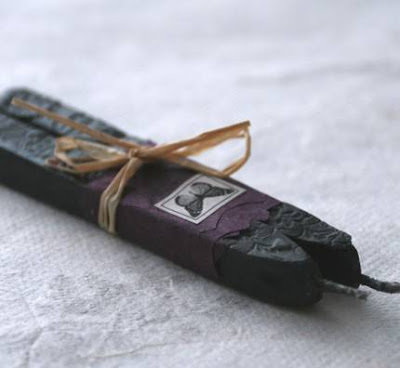 All-natural sealing wax is a lovely alternative, and you can find it at greencraftstore. Now, if you are lucky your friend will reply in kind, and soon you will bend down to retrieve the mail from in front of your door, riffle through and find a chatty, personal note waiting for you.